You make the most of every business minute! What’s the most useful tool in your business? Depending on your profession, you might say a computer...a hammer...or even the coffee machine that keeps you on that caffeine kick. But the truth is: regardless of what business you’re in, the telephone is your most useful tool, and with the dozens, or even hundreds, of calls you get each day, callers are sure to be placed on hold. That’s why you need Maximum Messages®, the most effective and economical marketing and image enhancement tool for your business. Don’t make your callers wait in that boring, soundless cell we call, "The Dead Zone." Or what’s worse, force them to listen to a static-ridden radio on-hold, or the office manager's favorite pick of the pop chart. Instead, make every minute of your business day work for you with Maximum Messages®. You tell us about your business, we’ll write a custom script for you, present your products and/or services with ThePower of Professional Voice, and complement your on-hold production with selections from our huge library of licensed background music. Additionally, we provide an easy-to-use, digital-download unit, featuring unsurpassed sound reproduction and built-in flash memory, all so you can play your Maximum Messages® over your phone line with no maintenance hassles. Maximum Messages® offers your business the flexibility you need to not only get the right message across to your customers but to also keep within your marketing budget. Choose our recurring service, and have your Maximum Messages® updated regularly throughout the year. Or select our As-Needed service, and update whenever you’d like, with no lengthy contract. 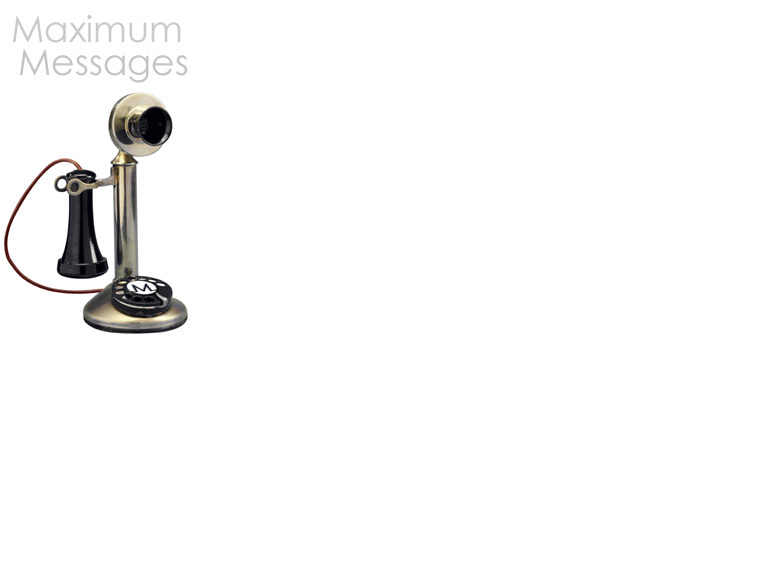 Regardless of which service you choose, your Maximum Messages® will receive our personal attention. Don't be fooled by companies who claim to "specialize" in your industry...your on-hold messages shouldn't sound like your competitor's. You've worked hard to set yourself apart from the rest, and when it comes to your audio marketing, you need the best. Maximum Messages®. What's more, with MaxCom’s talented team and in-house digital recording studios, we have the right resources to quickly get your Maximum Messages® to you. Quality. Expertise. Action. The Power of Professional Voice. Become a member of the Maximum Messages Family today! Start by building your own Maximum Messages. Playing the radio or CDs on your business telephone hold-line is NOT an alternative to dead-air. At the very least, it can annoy your callers, but what's worse is you could be advertising your competition on your own hold-line. Even more importantly, it's considered "illegal broadcast" by the Federal Communications Commission. Why be bothered with the hassles and potential fines? Choose custom on-hold Maximum Messages®.